Smoothies Galore! Easy-to-make recipes | Seniors Can Lose Belly Fat! Smoothies Galore! 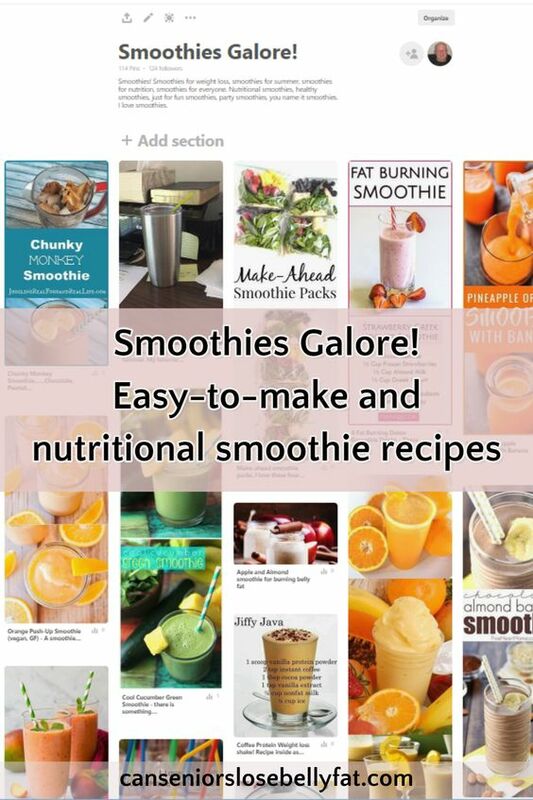 Easy-to-make nutritional smoothie recipes and information. Looking for some easy-to-make, nutritional smoothie ideas? Take a look below at these super easy smoothie recipes and how to instructions I have collected on this page. I have collected a LOT of great tasting, healthy smoothies on my Pinterest board here. But on this page, you will find my favorite smoothies, ideas, and how to directions. Cool Cucumber Green Smoothie. For the summertime or anytime. There is something amazing that fruits and vegetables do to make you feel good inside and out. The smoothie recipe includes cucumber, pineapple, strawberries, banana, and a bunch more nutrition. Guilt-free fruit smoothie for the whole family. This is a copycat of the Jamba Juice Aloha Pineapple smoothie recipe. The smoothie recipe includes pineapple, strawberries, banana, and greek yogurt. This smoothie is a perfectly delicious way to add lots of Vitamin C and other nutrients to fight off winter colds and flu. Carrots give it a vibrant orange color, and bananas, mangoes, and pineapple give it the best tropical flavor. It took some practice but now I know how to blend quick and easy smoothies! Packing a nutritious punch, these are great meal replacements. Need a quick breakfast? Or in a rush, don’t skip a meal. Try an easy-to-make smoothie. How to make quick and easy smoothies. These are 25 of the best ever quick and easy smoothie recipes and they are all so delicious. These recipes have the best combinations for the best flavor. Or experiment on your own and come up with your favorites! I have made some duds in my experimenting. But it has been fun learning about smoothies and trying different combinations. I will post more pictures as I find fruit and vegetable combinations my wife and I like. Another wonderful article from Smoothie Galore. Every of your post on how to different types of smoothies and their benefits to health are always of interest to me. Cold buster smoothie rich in vitamins C is cool as well as cool cucumber green, will have to try these out by weekend to nourish my body. You are welcome. I appreciate you stopping by and commenting. Healthy smoothies are a great way to nourish our bodies any time of the year. Thanks for commenting. Be careful about buying smoothies from outlets. They often take shortcuts and don’t use fresh fruits and vegetables.